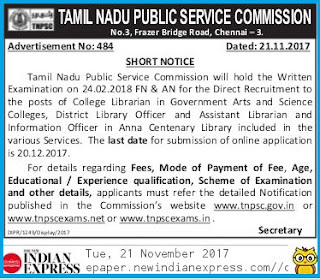 Tamil Nadu public Service Commission (TNPSC) will hold the Written Examination on 24.02.2018 for the recruitment of the Posts of College Librarian in Government Arts and Science Colleges, District Library Officer (DLO), Assistant Librarian and Information Officer in Anna Centenary Library included in the Various Services.The Last date for Submission of Online Application is on 20.12.2017. For Complete Notification, Minimum General Educational Qualification, Age Limit, Reservation, Examination Scheme, Payment of Fee, Syllabus, and other details refer to detailed Notification published in the Commission's Websiteon the Tamil Nadu Public Service Commission website www.tnpsc.gov.in. 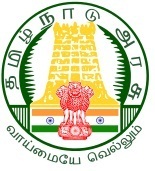 Notification No. 9//2016, Advertisement No. 439.